Ayahuasca is an ancient and sacred plant medicine that can lead to life-changing insights and growth. Even today, a social stigma surrounds Ayahuasca. That’s why I want to share my experience; to help shed light on centuries of misinformation and fear. Ayahuasca tourism is rampant in South America. You can buy vines and other medicinal plants in Iquitos’ Belen market. Ayahuasca is a gateway into your subconscious. It inspires you to uncover repressed memories and traumas, face your internal demons, find the light and rediscover to your true self. The medicine also reconnects you to realm of our enlightened ancestors. Basically, if you accept that all sentient beings are actually a single life-force that exists across space and time, Ayahuasca helps us access that universal consciousness. It sure was to me at first. But, after reflecting on our true purpose in life, I am completely convinced that it’s to be part of this universal consciousness and to spread love and compassion to all sentient beings. This is what an Ayahuasca vine looks like. At the Paititi Institute in Peru, Ayahuasca ceremonies are all-night affairs that take place in dark circular room (maloka) under the strict supervision of a well-trained shaman. After imbibing the medicine, a series of traditional incantations (Icaros) are sung in order to connect participants to the spirit of the plant and to our universal consciousness. This is usually when things start to heat up! During my first ceremony, I literally experienced death, the apocalypse, rebirth, infancy and a complete state of oneness with the universe. As time went on, I also reconnected with my ancestors, saw the light, discovered a new love for nature, came to countless insights about myself and the meaning of life and learned how to breathe. This scared space was where we held our Ayahuasca ceremonies at Paititi Institute in Iquitos, Peru. You know what? Two months ago I would have completely agreed with you! To some extent, I still do. In an Ayahuasca ceremony, the visions you see are connected to your subconscious or to the universal consciousness. The plant medicine simply takes that which you cannot (or will not) consciously acknowledge and puts a visual spin on it. Sometimes, that might look like a monster or some other scary sight. Other times, it can be a beautiful experience. Above all, it’s essential to trust that Ayahuasca is medicine. As such, it always knows what’s best for your body, soul and being. So yes, perhaps it was a hallucination … but anything that leads to positive and life changing new perspective is OK by me. Sitting on a dark maloka floor can get intense. That’s why Icaros are so important. “Shipibo shamans say that spirits, particularly plant spirits, teach them the Icaros. I can’t tell you how many times an Icaro’s melody rescued me from the depths of my subconscious and helped me sit upright into the lotus position. Similarly, the series of Icaros used after imbibing the medicine often jump-started my experience. During two ceremonies, we were joined by Shipibo shamans. These women brought their own unique Icaro melodies and mesmerizing voices to the maloka. Later, they showed us a collection of traditional tapestries that incorporate Icaro sounds into the weaving. Watch this video to hear their Icaros and see how the sounds are woven into their tapestries. Cecilia demonstrates the music embedded in her Ayahuasca-inspired tapestries. What’s the Science Behind Ayahuasca? At any given moment, the human brain receives upwards of two million bits of information. It only can process 5,000 of them. Neuroscientists have discovered that drinking Ayahuasca can increase that by up to 300%. Imagine what you can do with that extra brain capacity. 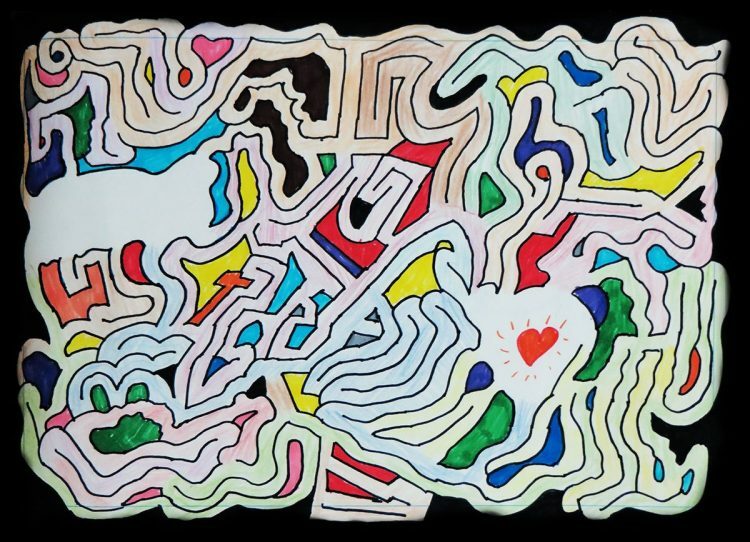 As a kid, I loved drawing mazes. At Paititi, I rediscovered that love. Where Does Ayahuasca Come From? 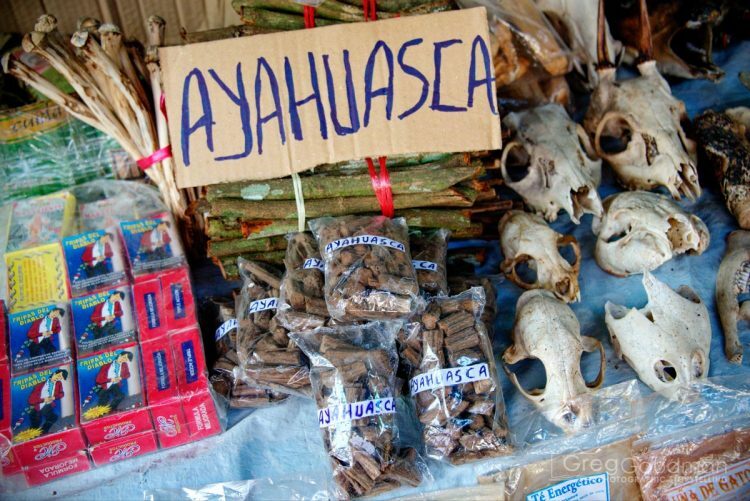 The medicine combines two sacred plants: Ayahuasca and Chacruna. 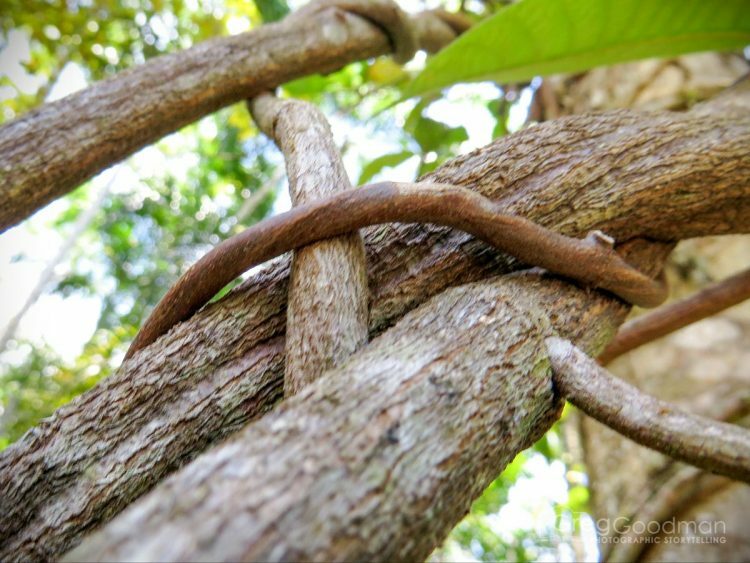 Ayahuasca’s vines are the activator, which opens the blood-brain barrier. Chacruna leaves contain the spirit molecule; which acts as a neurotransmitter and allows DMT to enter your being. After cooking and distilling these plants together over a three day ceremony, the concentrated liquid is quite thick and ready to drink. I had the opportunity to help cook the sacred medicine. This is what that process looked like. But is Ayahuasca a drug? When fate brought me to Paititi Institute for a month-long transformation retreat involving Ayahuasca and other sacred medicinal plants, I was very apprehensive. “Am I just going to the jungle to do drugs with a bunch of hippies,” I wondered? Let’s assume that any drug’s main purpose is to help the user escape reality and achieve a false sense of euphoria. Ayahuasca, meanwhile, inspires presence, breathing and connection. While there are times of bliss, my ceremonies often were spent in a state of internal turmoil, difficult self-realization and frequent purging. That sounds like medicine to me! This drawing sums up my experience with Ayahuasca. My experiences with Ayahuasca came during Paititi Institute’s Embodying True Nature: Consciousness Transformation Retreat. For a month, I lived in Peru’s Amazon Rainforest … rediscovering myself, learning to love unconditionally and letting go of stale beliefs and patterns. Much of this work took place without the influence of sacred plant medicine. Just me … alone in my hut with a hammock and journal. What follows are some of my favorite realizations about our universe and existence. 1.5 hours of stars moving above the Paititi maloka. All we are is this breath. Your center is always with you. I am you. You are we. Time is an illusion. All there is is this moment and our breath. My breath is our life. You don’t need more words. Have gratitude for every moment. Reside in the moment; it’s all we have. Every little thing in the universe has a purpose. It’s ok to be lost. Present the present as a present. Being loud is not the same as being heard. You already know the answer to everything. When the heart is ready, it will know what to do. You can never get a moment back. As soon as you start trying, it becomes the chase of a memory that is forever changing. Listen to what your body wants, not what the mind tells you the body wants. Sadness is ok. Without it, happiness is an illusion. Experience life with the wonderment of a child. An Ayahuasca flower drawn on the maloka wall at the Paititi Institute in Iquitos, Peru. I would love to hear your opinions on Ayahuasca and my story in the comments section below.